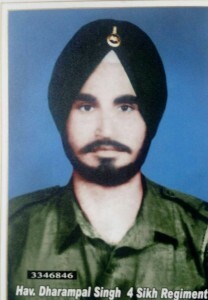 Havildar Dharampal Singh from Bathinda is alleged to have been captured by the Pakistani security forces during the 1971 Indo-Pak War. It is further alleged that Havildar Dharampal Singh is alive and continues to be detained in Pakistan. Havildar Dharampal Singh’s name is not on the official list of the ‘missing Indian POWs’. The official list refers to ’54’ Indian POWs detained by the Pakistani authorities. Official records do not disclose the fate of Havildar Dharampal Singh. His army identity bracelet and his personal belongings were never returned to his wife. Mr Satish Kumar an Indian national imprisoned in Pakistan in or around 1974, Mr Kumar was released and repatriated to India in 1986, He adamantly maintains that he met a number of the Indian POWs during his twelve year incarceration in Pakistan, including meeting Havildar Dharampal Singh. 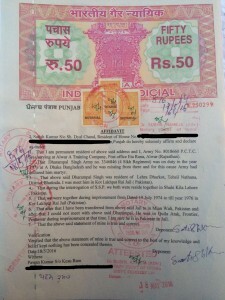 Mr Satish Kumar has provided a sworn affidavit supporting his allegations.